Rookie Corey Banks swims to first place in the 25 free. It was an amazing weekend for the Riptides at the Dino Cup in Calgary. The girls team, led by medal performances from Avi, Emiko, Emily, Tanzin, and Kassandra; finished 6th out of 13 teams. Avi broke three club records in the 10&U 25 back, breast and fly and won 2 gold and 1 silver medal. Emiko recorded 3 new B times and struck gold in the 25 free and silver in the 25 back. Emily led the 9 yr girls group with silver medals in the 25 free and 25 fly, while Tanzin and Kassandra won a bronze each. Corey topped the podium for the 8 yr boys group winning gold in the 25 free, while Domenic swam to bronze in the 9 yr boys 25 free. More results to come in the coach’s report. 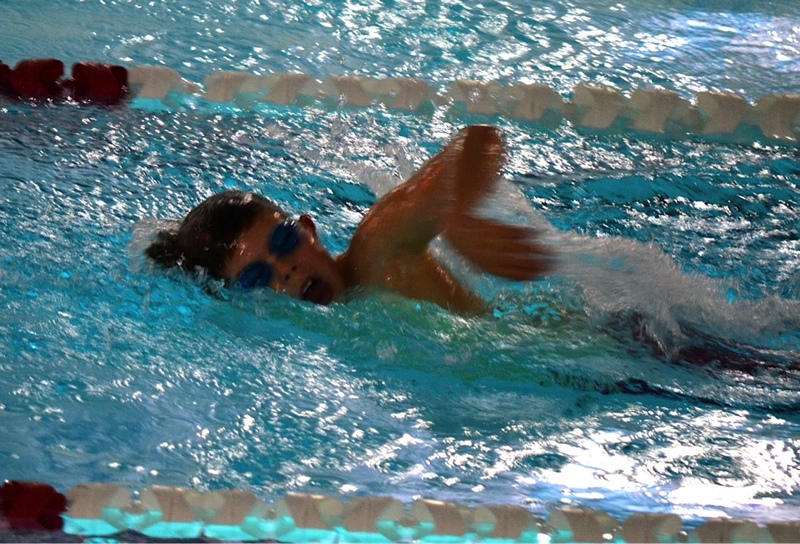 This entry was posted in Meet Results and tagged Championships, Medals, Records by bowvalleyriptides. Bookmark the permalink.